Haley Heynderickx has a wonderful singing voice. Even so, the most powerful moment on Heynderickx' debut record is where she breaks it. On the late-album treat, "Oom Sha La La", she lists some seemingly small problems, including sour milk and the gap in her teeth, but then caps it off with this heavy anchor: "The brink of my existence is essentially a comedy." Although, at almost exactly the middle point of the song, it all changes: "I'm throwing out the milk… I'm tired of my mind getting heavy with mold." Then she repeats the album title, "I need to start a garden", four times, letting her voice go more with each repetition, all the way to the last where a yelling Heynderickx sounds distraught and exposed. It's raw and cathartic, but it's all wrapped up in a song with heavily absurd lyrics that is called "Oom Sha La La". 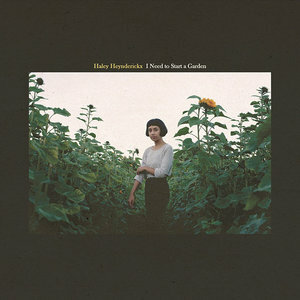 As it is, this single song encapsulates the aesthetic of Heynderickx' debut, I Need to Start a Garden, fairly well: It's a sad world, but it's also absurd, so let's show some humility. That's not to say that the whole album is as playful. That's far from the truth. Opener "No Face" starts the album off solemnly. A nylon-string guitar floats in softly to back up Heynderickx as she uses wild imagery to describe a disconnect between two people. "You're alone. Well, I wish I had have known," she whispers. Later, on "Jo" she keeps the same mood, but swaps the acoustic out with a quiet electric guitar: "Jo, You are alone. You're kindness the sweetest that I've ever known. Like honeycomb holding the bee in the folds." The closing track, "Drinking Song", finds Heynderickx exploring the community of the local watering hole: "…everyone's singing along. The good, the bad, and the gone." This side of Heynderickx is simple with a straight face. On a number of other tracks on the album, she smirks through it all. "The Bug Collector" find the protagonist 'saving' a loved one from bugs in their home. As she collects, she dramatizes the whole scene. She describes a praying mantis on the bathtub: "…You swear it's a priest from a past life out to get you." She closes out the verse by putting the priest "into a jam jar". It's easily one of the most unassuming and fun songs so far this year. The album's centerpiece is the nearly-eight-minute "Worth It", and just like "Oom Sha La La", it showcases so many sides of Heynderickx, both musically and lyrically. Musically, the song is an emotional roller-coaster, starting on a guitar-led groove, moving to a Nirvana-like rave-up in the middle, and finally riding out on shoegaze guitar. Lyrically, she speaks sarcastically up to the second half, when she says, "Put me in a box, boy. Anything goes, anything you want." She closes the song in a different manner, though: "Maybe I'm being selfish, but I'm worth it." So, the album is quite a journey, but in the end, Heynderickx has a simple message to put forward, stated simply in the song, "Jo": "Be good or be gone." Throughout I Need to Start a Garden, she speaks of improvement. She strives to be good, but she's honest about the difficulty human life brings forth. Humility is a virtue. Her songs display this, and it's refreshing to be sure.